Aaaaaaand I've already lost them. Now before you start filling your cargo shorts with beef jerky in preparation for the line at the Apple store, there are important questions regarding these new wireless earbuds. Is there a warranty for when I lose these AirPods? How much will the replacements cost when I lose them? Who do I call when I lose them? Can I visit the Apple store when I lose them? What if I lose just one? What if I miraculously don’t lose my AirPods for like a really long time and then newer generations of AirPods come out, can I still get replacements? Will other wireless earbuds work on my phone if I need to borrow someone else’s after losing mine? What if I lose just one, and you ship me a replacement, and while that’s being shipped, I lose the other one? Is Apple going to release some type of tethering device that could “attach” the AirPods to my phone? Apparently there’s a dongle you can buy so that you can keep using your traditional jacked headphones. Can you you call it something besides “dongle”? Is there any way I can order this without having to say the word “dongle”? The AirPods reportedly last five hours without recharging. How long will the AirPods retain the remaining charge after I’ve misplaced them only an hour out of the store? Let’s say I die and I want to leave my earbuds ― which I’ve somehow, by the grace of God, held onto all this time ― to my next of kin. Does the replacement plan transfer over to them when they inevitably lose them within the first week? OK, I’m on a train and I lose my AirPods. Obviously. The thing is, someone else on that train with Apple’s AirPods also loses their set. Miraculously, we find each other’s AirPods and take ownership of them. We’ll never run into one another again to exchange them. So when I lose this stranger’s AirPods later that week, do I get to have them replaced as if they were my own? 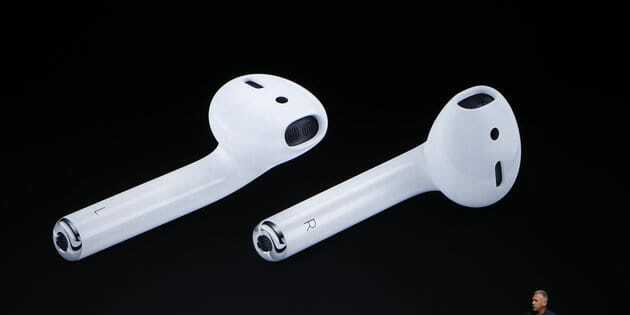 Given that probably millions of pairs of these AirPods will be lost in the world and perhaps never seen again, are they biodegradable? Will my AirPods someday choke a sea turtle? Or will animals lose these AirPods too before any harm comes to them? Thanks, Tim Cook. I look forward to your response.